Progressive overload. That’s the first rule for building muscle, and it will always hold true: Gradually increase the reps, sets, or weights you use, and you’ll continually force your muscles to adapt by growing bigger. It’s also the guiding principle behind the following calf workout, which you should perform at the end of your leg workouts twice a week. The workout utilizes the total-rep method—pick a certain number of total reps to perform in your first workout, no matter how many sets it takes. Then build on that total weekly. You’ll perform one calf exercise—either the standing calf raise or seated calf raise—in each of your leg workouts. Choose a load that allows you to do at least 10 reps, then perform as many sets as it takes to do 30 total reps. Rest 45 seconds between sets. Each week, try to add at least five reps to your total. When you can do 50 total reps in five sets or fewer, increase the weight by 20–30 pounds and start at 30 reps again. 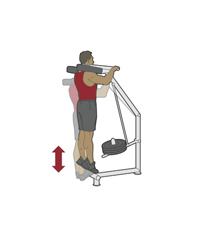 For variety, feel free to occasionally mix in single-leg versions of standing and seated calf raises. Rest 30 seconds between sets in this case. The standing calf raise primarily works your gastrocnemius, the big diamond-shaped calf muscle. The seated calf raise focuses on the soleus, a strip of muscle on the side of the calf. Both need to be trained for full-looking calves. 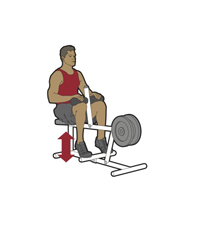 Use a calf-raise machine or stand on a block holding a dumbbell in one hand (use the other hand for balance). Bend your knees slightly and lower your heels until you feel a stretch in your calves. Then extend your knees and raise your heels. On a seated calf-raise machine or bench, sit and place your feet on a block with knees bent 90 degrees and rest some weight plates on your thighs. Perform a calf raise as described above.